Are you an individual or a business (e.g. wellness or beauty center, therapist, massagist, acupuncturist, stockist, sauna, hospital etc.) and you would like to use dōTERRA essential oils, blends and products in your own service or therapy, or offer them for retail and start earning income by bringing a pure and natural form of healthcare to people? And you are looking for interesting prices and discounts? Then please have a look at the advantages of joining the Independent Product Consultant network of Essential Oils Ireland, and start enjoying the many benefits of becoming a part of it yourself. It is very easy: below you find a link to the registration page, where you can register for your own dōTERRA Wellness Advocate account (as a part of the Essential Oils Ireland network). You can enter your details, and then chose either to pay a 20 EUR registration fee or select one of the enrolment packages that include the registration fee. 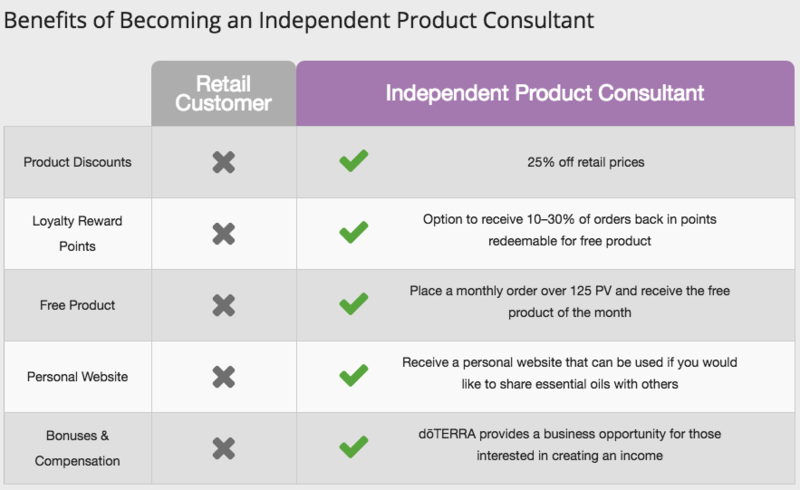 In the next step, you can setup your monthly Loyalty Rewards Program Order: a monthly value order of around 100 EUR (measured in points shown as PV in the dōTERRA order dashboard, and it needs to be above 100 PV) is required to earn commissions and get the additional 10% - 30% discount. You can easily chose the products and set the monthly shipping date, and you can always change products, shipping dates and quantities later - as long as the minimum value is maintained in the LRP order, you will furthermore be eligible to receive commissions. You do not have to make a big investment to benefit from quantity discounts, as there are none. You can see what works and what doesn't work for you and your customers, and adapt your monthly orders accordingly. Your account allows you complete flexibility and gives you very interesting savings opportunities. If you stay in the program for longer than 13 months, the discount rate associated with the monthly LRP order increases over time from initially 10% or 15% to 30% after the 13th month. We as Essential Oils Ireland will support you with any questions you have, e.g. the order interface and order process, questions about oils and blends and their application in therapy, and also help you with any business-related questions.